Painting from India survives from at least the 5th century in the form of magnificent murals on the interior of Buddhist monasteries, and then later in Buddhist and Jain religious manuscripts painting on palm leaves. By the 14th century, paper, originally invented in China and introduced to India by Muslims who understood its advantages, was used for documents, both with and without illustrations. By the 18th century, painting on paper was widespread and found particular appeal in India's multiple courts, especially in western and northwestern regions. 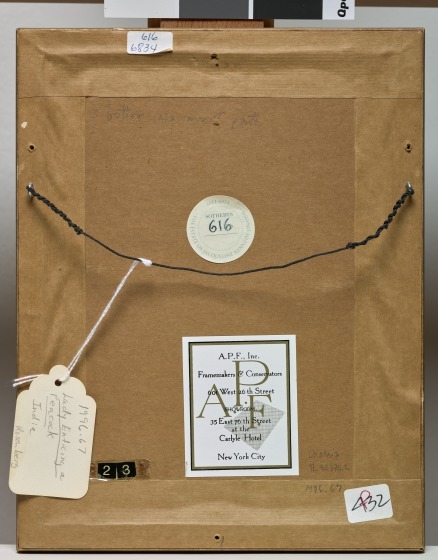 Many painting styles evolved that, while similar, can be differentiated, a development that was intentional on the part of patrons as a statement of their own political and cultural prowess. 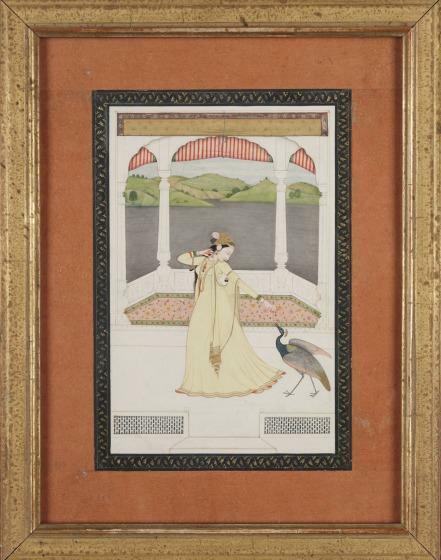 This elegant painting and Lady on terrace with a hookah [1996.68], both from the collection of the late Jacqueline Kennedy Onassis were executed in the Punjab Hills in northwestern India. The lyrical forms of these lovely women in refined architectural settings overlooking vast landscapes are typical of this school of painting, often referred to as "Pahari," meaining "of the hills." The long stitched gowns and diaphanous veils draped over the shoulders of the women in both paintings are also characteristic of dress in this part of India. The woman with the peacock wears a rich textile on her head similar to a turban, probably a mark of devotion to a lover or deity. Both women wear necklaces, earrings, and jeweled arm bands. The greenery in each painting and the lake in the peacock painting depict spring in the Indian hills. That this painting is intended to represent spring is underscored by the peacock itself, whose long resplendent tail is just beginning its annual regrowth. In India, this natural process begins for peacocks about February, which is the beginning of spring there, and the process of molting is complete by the end of the mating season, usually in August. Paintings like this are not intended to relate a story or depict an image of the divine but rather to evoke an emotion or mood (bhava) that is reminiscent of the lover who is yearning for union with the beloved. 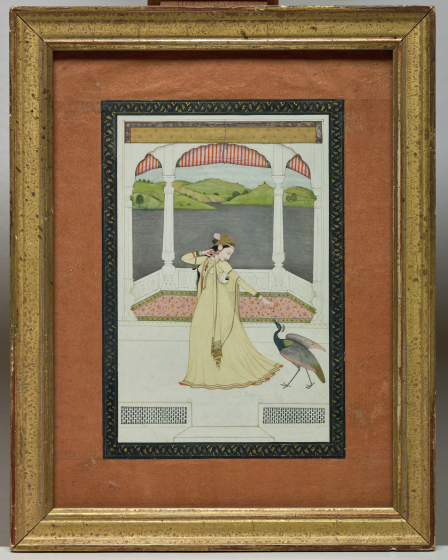 In paintings where the rainy season, or monsoon, is depicted by night scenes and lightning flashes, the presence of a peacock would evoke, in the mind of the viewer, the bird's mournful piercing cry which is associated with the yearning lover. In this painting the woman plays with the peacock by tempting him with pearls, suggesting her awakening to spring and the stirring of sexual desire. The painting with the peacock was almost surely part of a set wherein a peacock with full tail, the symbol of mating, is the focus of a subsequent illustration. These paintings evoke emotions and moods through elegant forms, delicate pastel colors, and women whose isolation from others suggests a mental and physical loneliness that the informed viewer would more than understand. 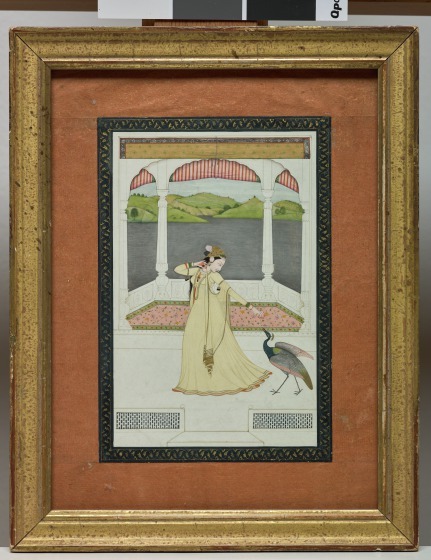 Catherine Asher "Lady enticing a peacock with a strand of pearls" in The Arts of India, South East Asia, and the Himalayas, Anne R. Bromberg (Dallas: Dallas Museum of Art; New Haven: Yale University Press, 2013), 125.